CPS Energy employees demonstrate that they are not only dedicated in their jobs but are also passionate about lending a helping hand, lending an ear and lending support to help our Greater San Antonio community and its residents… even some furry, four-legged ones. 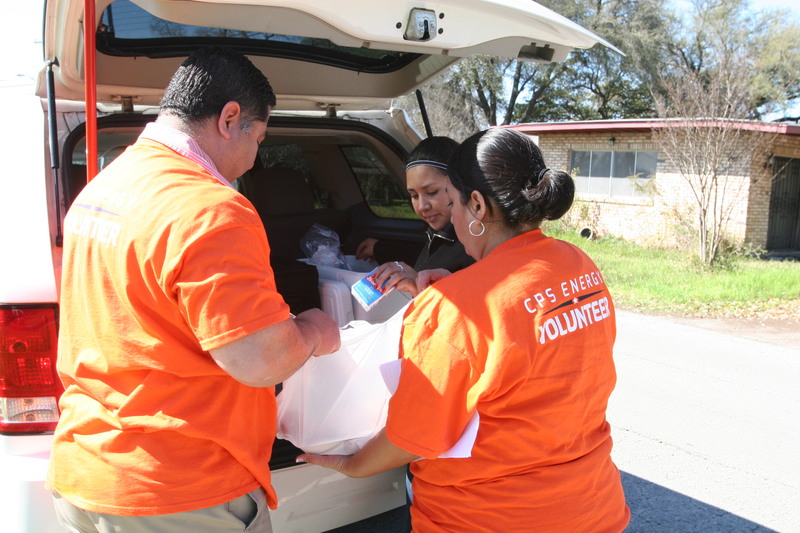 When a large number of folks were carrying out Spring Break plans, a group of our team member volunteers were carrying meals to home-bound seniors, through the Christian Senior Services (CSS) Meals on Wheels program. Collectively, they delivered more than 140 meals that week. “My family really enjoyed the experience and brightening people’s day,” said Patricia Diaz, who delivered meals alongside her husband Daniel and 14-year-old daughter Danielle. “We could tell that some of the people [meal recipients] lived by themselves, so it felt good to be a friendly face checking in on them to make sure they were OK.” As a result of this gratifying experience, Daniel now plans to deliver meals on a weekly basis, while Danielle hopes to help CSS this summer by preparing meals for delivery. The Diaz family delivering warm meals to seniors through the Meals on Wheels program. A volunteer corps from our Northwest Service District assisted at the animal adoption center, San Antonio Pets Alive! To improve the “social skills” of the shelter’s dogs and puppies so they become more adoptable, volunteers take the canines for walks and spend time nurturing and playing with them. Meanwhile, a team of 14 team members from our Southwest Service District and Malone Administration Building devoted a recent Saturday to “spring cleaning” at the Ronald McDonald House and to prepare a barbecue meal for the agency’s 30 guests. 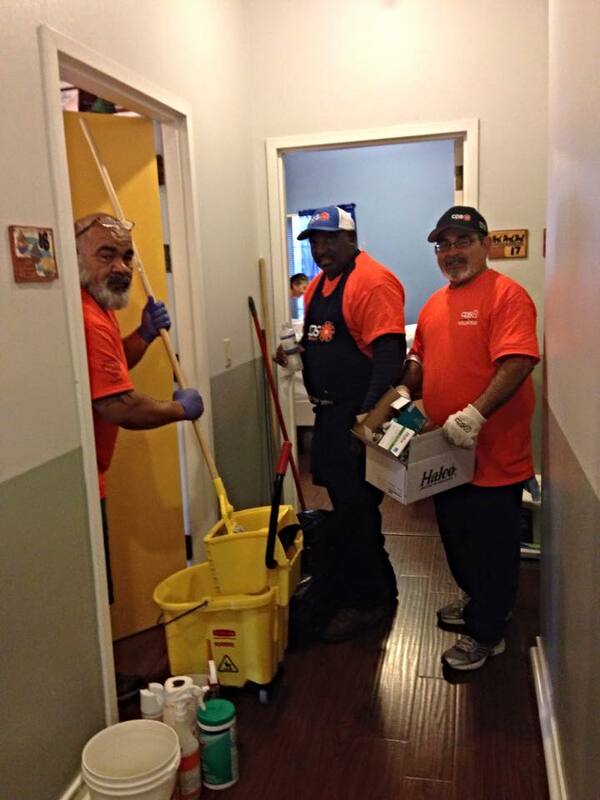 Our team members are not afraid of a little mop and cleaning supplies. “It was really refreshing to see [these] folks give up part of their weekend to prepare a hot delicious meal for us. They even took the time to talk to us and our children. It made me feel real good,” said Leticia Sanchez of Utah. She and her son Oscar have been staying at the Ronald McDonald House for more than six weeks. For those not familiar with the agency, the Ronald McDonald House offers “home-away-from-home” lodging for out-of-town families, so they can be near their hospitalized child. Approximately 100 of our team members and their family and friends marched through streets and pathways to show their support at the Cesar Chavez March for Justice and the March of Dimes March for Babies. This is just a snapshot of how our employees are making a difference in the community, a commitment that is year-round. Read our Community Engagement Report available on our website to learn more.